The most insulating glazing units currently have U-factors as low as 0.3-0.5 Watts per square meter Kelvin (W/(m2 K)) and typically employ three glass layers, two or more low-emissivity (low-e) coatings, and an inert gas fill. The most insulating window frames have U-factors as low as 0.6 - 0.8 W/(m2 K) and typically employ low thermal conductivity materials within, or part of, the structural frame. Previous simulation studies analyzing the effects of frame and spacer surface emissivity and conductivity defined research targets for window frame components that will result in better frame thermal performance than is exhibited by the best products available on the market today (Gustavsen et al. 2011). This work expands on the previous research by describing simulation studies analyzing thermal bridging effects of non-continuous operating (and non-operating) hardware in common casement style window frame designs. We use finite volume computational fluid dynamics (CFD) modeling to demonstrate the change in sill U-factor for configurations using typical hardware systems. The thermal effects of hardware are currently ignored in the relatively low performing double pane windows common today, but may become significant in high performance windows. 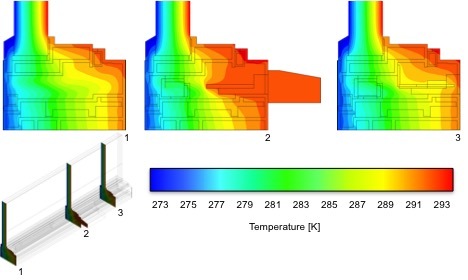 We performed thermal performance simulations on four different window frames: One aluminum clad wood frame (Frame A), one fiberglass (Frame B), and two polyvinyl chloride (PVC) frames (Frames C and D). All the frames were of the outward-opening casement type except Frame D, which was inward opening. The most significant hardware penetration in each frame is at the sill, therefore the sill frame cross-section is the focus of this work. The modeled sill length of 610 mm the hardware case reflects National Fenestration Rating Council (NFRC) 100 requirements. Three-dimensional frame slices 25.4 mm wide were modeled without hardware to determine the base (reference) performance. Since there are no three-dimensional effects, these models are equivalent to two-dimensional modeling. The simulated models are simplified representations of common industry frames. Simplification significantly reduces computing time and improves numerical accuracy in the three-dimensional hardware case, but with the risk of inaccurate representation of the actual frame. To address this, we modeled both the actual design and a simplified version for each frame without hardware and verified that the simulated U-factor of the simplified models were within five percent of models with no simplifications. To aid comparisons between the frames, the conductivity of the glazing systems is held constant. Some conclusions can be drawn regarding the impacts of operating hardware on the thermal performance based on the individual frames, although few general trends can be observed due to the large design differences between each frame section modeled in this study. It is clear that the hardware used in typical out-opening casement windows may have a significant impact on the overall thermal performance of the frame, as two of the three frame sills modeled show reduced performance greater than 0.05 W/(m2 K). It is also clear that the fastener types, operator location, and other factors related to the method of hardware implementation can significantly impact the effect of hardware on the frame. Greater penetration depth of hardware from the warm side surface to the cold side resulted in reduced thermal performance in three of the four frames modeled (Frames A, C, and D). In Frame B, the increased conduction of the hardware was nearly equalized by reduced convection heat transfer made possible by the hardware placement. Neither the base performance level nor the primary frame material appears to determine the thermal effect of hardware based on those metrics alone. 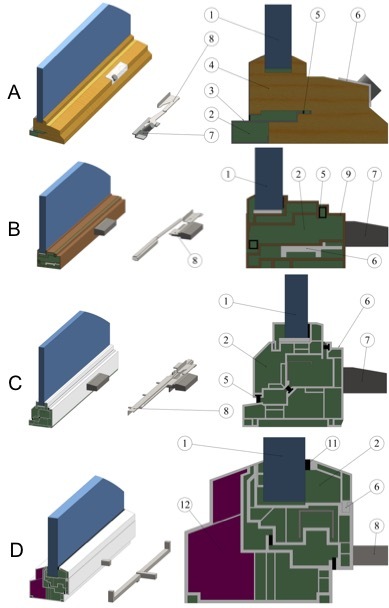 The work presented in this study is the initial phase of a larger investigation to determine if the development of new modeling requirements for existing rating systems is needed to properly account for window hardware. This will include validating new thermal rating methods and introducing new technical procedures for incorporating hardware effects into whole window thermal rating methods. Based on the results from this initial study, we will perform more detailed sensitivity analysis on frame materials, hardware locations, and hardware penetrations. We will also extend our investigations to the performance impacts for alternative frame profiles, including jambs and heads, and frame types, including vertical and horizontal sliders and patio doors. A sensitivity analysis of full frame thermal performance impacts with the same frames is also planned to determine the impact of hardware when the glazing systems improves without changes to the frame. Experimental validation testing of select products in a guarded hot box to verify performance impacts demonstrated in the modeling is also under consideration. Hart, Robert, Cezary Misiopecki, Dariush K. Arasteh, Arlid Gustavsen, and Bjørn Petter Jelle. "Impacts of Operating Hardware on Window Thermal Performance." In BEST3 Conference. Atlanta, GA, 2012. Gustavsen, A., S. Grynning, D. Arasteh, B.P. Jelle, and H. Goudey. 2011. "Key Elements of and Materials Performance Targets for Highly Insulating Window Frames." Energy and Buildings, Volume 43(10).